Dravo Wellman Company, a Cleveland-based subsidiary of Dravo Corporation, Pittsburgh, has received a contract in excess of $9 million f r om Seaboard Coastline Railroad Company for expansion of a rail-to-ocean vessel phosphate transfer terminal at Tampa, Fla. Designed to supplement existing facilities and give more flexibility to the 3,000- ton-per-hour terminal, the expansion will allow two trains to be unloaded instead of one. The project is scheduled for completion in December 1981. The expansion will include engineering, supply and installation of a train positioner, car dumper, belt scale, dust collector system, and conveyor system. The existing dock and associated conveyor and shiploader runway will be lengthened by 815 feet. 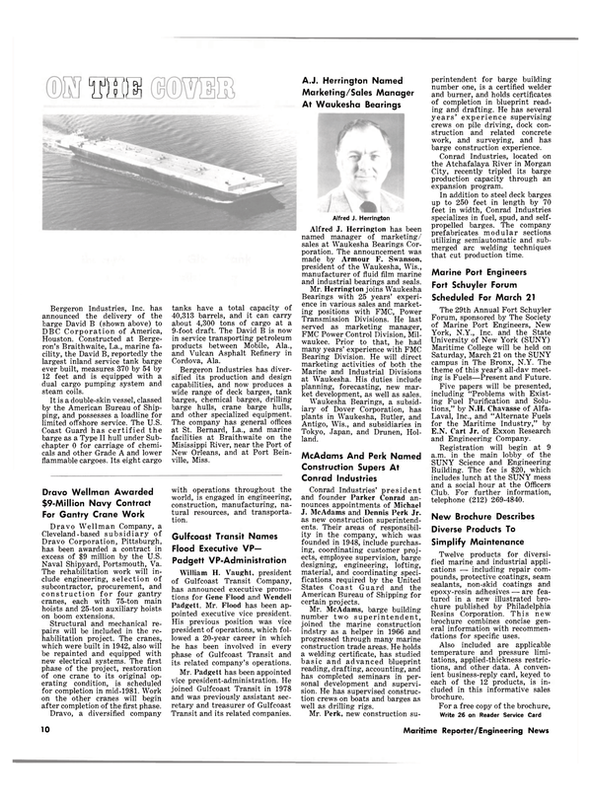 Dravo Wellman built the original transfer terminal for Seaboard Coastline in 1967-68. Dravo Wellman's principal activities include engineering and development of bulk materials handling systems, railcar rotary unloader systems, shiploaders, stackers, and coal ash handlers.